IEC 60320 C14 C13 Power Cords utilizing LOW SMOKE ZERO HALOGEN cordage (BSI, HAR, ROHS, IEC, HD21.14, BS EN 50525-3-11). For installation where fire, smoke emission, and toxic fumes create a potential threat to life and equipment. Common abbreviations for Low Smoke Zero Halogen are LSZH, LS0H, LSOH, LSFH, 0HLS, OHLS. This 1 FT C14 C13 LSZH power cord can be used in data centers to help protect against damage to humans and equipment in case of fire. Typically used to connect a PDU to a server, router, or switch. Below is one the typical applications of a C13 to C14 power cord connecting a Rack Mount PDU (Power Distribution Unit) to a Server, Router, or Switch. This scenario is extremely common in data center environments and in enterprise networking rooms. 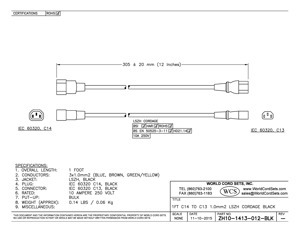 World Cord Sets, Inc is a leading distributor and manufacturer of Black 10A C14 C13 LSZH Power Cords's. Besides stocking North America Power Cords, International Power Cords, GFCI's, RCD's, Data Center Cables, and more, World Cord Sets is a leader in custom Power Cords, Data Cables, GFCI's and more , including 10A C13 C14 LSZH Power Cables . With the ability to assemble small quantity custom products, or mold custom cables for large orders, we have the cable to fit your needs. Visit our Power Cable Matrix to find the Plug/Connector configuration you are looking for.